Timothy K. Perttula is an Affiliated Researcher with the Texas Archeological Research Lab. This article is part of the December 2017 issue of the TARL Newsletter. Woodland period artifact assemblages in inland Southeast Texas dating from as early as ca. 2100 B.P. have ceramic vessels, particularly sandy paste wares of the Goose Creek Plain series; Lower Mississippi Valley Tchefuncte and Marksville wares also occur in low frequencies in inland Southeast Texas Woodland period sites. These sites are part of the Mossy Grove culture (Story 1990:257) (Figure 1). By ca. A.D. 1000, Late Prehistoric ceramic wares were made with grog temper, and these grog-tempered ceramics have stylistic and cultural affiliations with ancestral Caddo groups in the Neches/Angelina and Sabine River basins as well as with coastal Texas groups. The grog-tempered ceramics are likely from vessels obtained from ancestral Caddo groups living in East Texas. Figure 1. Selected Mossy Grove culture sites in Southeast and East Texas:1, Coral Snake (16SA37); 2, Wolfshead (41SA117); 3, Runnells 1 (41SA87) and Runnells 2 (41SA86); 4, Jonas Short (41SA101); 5, Naconiche Creek (41NA236); 6, Boyette (41NA285); 7, Deshazo (41NA27); 8, George C. Davis (41CE19); 9, Westerman (41HO15); 10, Crawford (41PK69); 11, Burris 1 (41PK88) and Burris 2 (41PK89); 12, Jones Hill (41PK8); 13, 41PK21; 14, Houston (41SJ19); 15, Trichel (41SJ16); 16, Strawberry Hill (41SJ160); 17, 41MQ6; 18, 41MQ5; and 19, 41MQ4. Figure based on Story (1990:Figure 39). Sandy paste sherds from Goose Creek Plain, var. unspecified vessels are the principal Mossy Grove ceramics (between 80-95 percent) in the 20+ assemblages of ceramic vessel sherds and more than 15,000 sherds I examined for this study from sites in Montgomery (Lake Conroe), Polk (Lake Livingston), San Jacinto, and Walker counties. A small percentage of Goose Creek Plain, var. unspecified sherds have naturally occurring hematite nodules in the paste, and may come from vessels manufactured along the upper Texas Coast (Linda W. Ellis, June 2017 personal communication). The Goose Creek Plain, var. 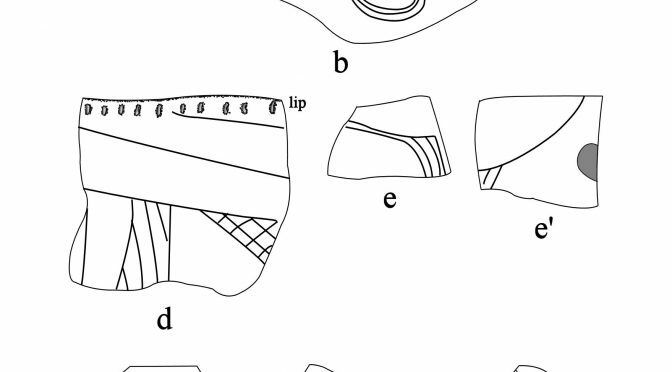 unspecified sherds in general are from compact and smoothed vessels made by coiling, probably jars or deep bowls. The smoothing served to better weld the coils together before firing. The paste is not contorted, thus suggesting that vessels were decently prepared for vessel shaping. The remainder of the ceramics in these collections are from tempered ancestral Caddo ceramics, especially plain or decorated sherds from grog-tempered and grog-tempered-sandy paste vessels (2.7-19.5 percent of the assemblages). 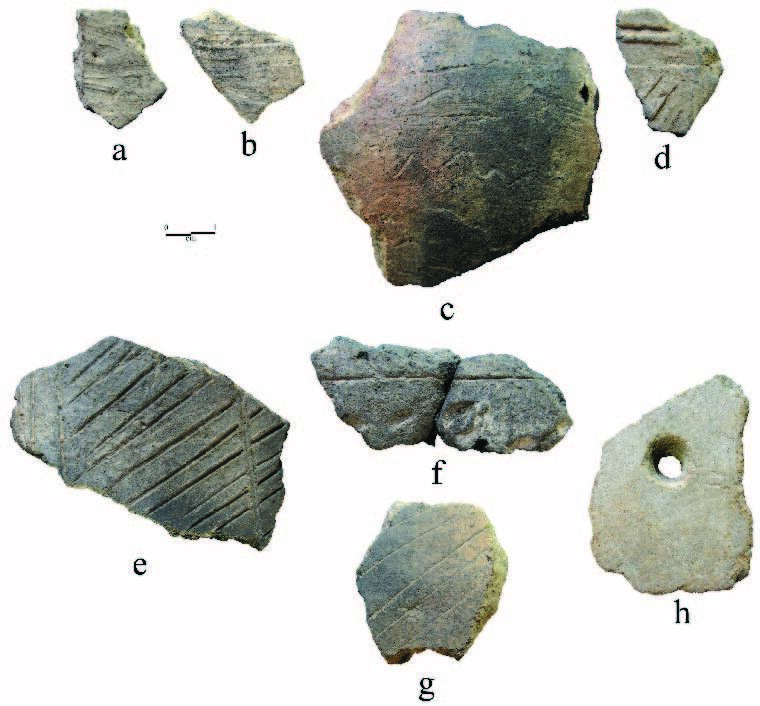 The largest ceramic vessel sherd assemblages are from the Burris 1 (41PK88) (n=6042), Jones Hill (41PK8) (n=2226), Strawberry Hill (41SJ160) (n=1834), 41MQ6 (n=1212), Houston (41SJ19) (n=1077), and Burris 2 (41PK89) (n=468) sites, and these assemblages have been employed for comparisons with each other in terms of paste and temper characteristics as well as decorative methods and elements. The sherd collections I examined are curated at Stephen F. Austin State University and the Texas Archeological Research Laboratory. Figure 2. 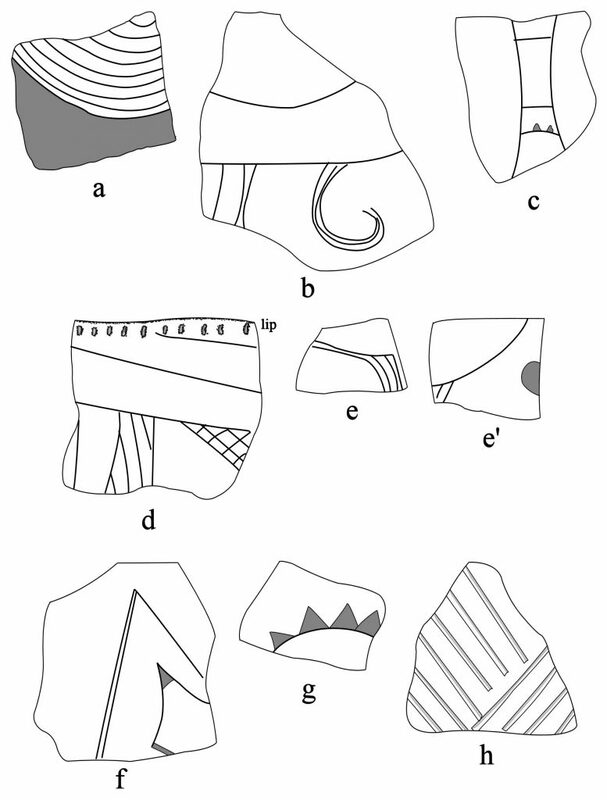 Selected decorated sherds and a sherd with a drilled hole from the Strawberry Hill site: a, brushed, Lot 20; b, brushed, Lot 8; c, Wavy incised, Goose Creek Incised, Lot 7; d, diagonal opposed incised lines, Lot 24; e, diagonal opposed incised panels, Lot 0; f, incised-punctated, Lot 0; g, fine line parallel engraved, Lot 0; h, sherd with drilled hole, Goose Creek Plain, Lot 0.
sites postdate ca. A.D. 900-1000, and they correlate in time with the introduction and use of ancestral Caddo ceramic wares. Based on the identification of a number of defined ceramic types, the ancestral Caddo tempered wares from Mossy Grove sites in the Conroe-Livingston area can be sorted into types from three different chronological periods: pre-A.D. 1200, Late Caddo period (ca. A.D. 1400-1680), and Historic Caddo period (ca. A.D. 1680-1730). The suite of Early Caddo period types, including Davis Incised, Dunkin Incised, Holly Fine Engraved (Figure 3a), Kiam Incised, and Weches Fingernail-Impressed, var. Weches is most abundant at the Burris 1 site, but there are examples of Holly Fine Engraved and Kiam Incised from 41MQ6 and Strawberry Hill. 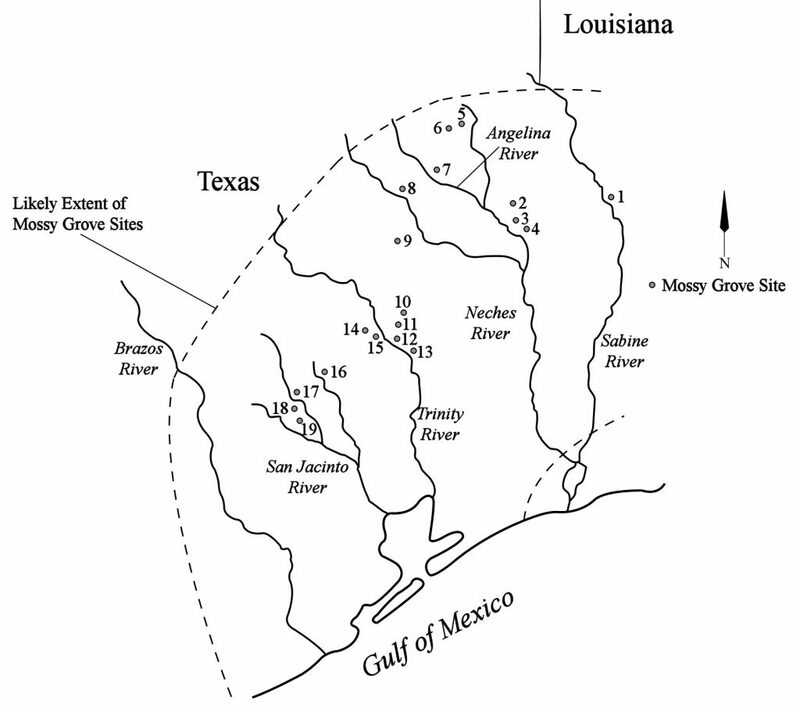 The range of defined types are associated with Early Caddo period communities on the Neches River, likely the large Caddo mound center and village at the George C. Davis site (41CE19). body sherd with curvilinear engraved line-excised pendant triangle elements; h, Keno Trailed body sherd. Ancestral Caddo period utility ware and fine ware vessel sherds from Late Caddo Ancestral Caddo period utility ware and fine ware vessel sherds from Late Caddo period (ca. A.D. 1400-1680) vessels are more abundant in these Mossy Grove culture sites; two sherds at two Mossy Grove sites (41MQ6 and Burris 1) with asphaltum designs or surface coating are from Rockport wares, and likely date to the same post-A.D. 1400 interval. Given the common occurrence of sherds from tempered Caddo brushed vessels, the post-A.D. 1400 use of these Mossy Grove sites was considerable, given that the manufacture and use of brushed vessels is a feature of post-A.D. 1400 Caddo ceramic traditions in much of East Texas. In general, the identified ancestral Caddo ceramic types, including Bullard Brushed (see Figures 2a-b), Maydelle Incised, Pease Brushed-Incised, and Poynor Engraved (see Figure 3e-e’), point to interrelationships between Mossy Grove peoples and Frankston phase Caddo communities in the upper and middle Neches River basin in East Texas marked by the trade or exchange of ceramic vessels from Caddo groups. The presence of Ripley Engraved sherds (see Figure 3f-g) from the Burris 1 site also suggests contacts between Mossy Grove peoples and Caddo groups affiliated with the Titus phase; these Caddo groups lived in the Big Cypress and mid-Sabine River basins. The Historic Caddo ceramic types in the Mossy Grove sites are confined to the Burris 1 and Houston sites. The utility wares include Foster Trailed-Incised, var. Moore and Spradley Brushed-Incised types, and their occurrence suggest wide-ranging contacts between Mossy Grove groups and ancestral Hasinai Caddo and Kadohadacho communities in the Neches-Angelina (e.g., Spradley Brushed-Incised) and the Red River (e.g., Foster Trailed-Incised) basins, respectively. The same can be said for the fine wares, as Patton Engraved (which is present at the Burris 1 site) occurs in Hasinai Caddo communities on the Neches-Angelina, and Keno Trailed vessels (see Figure 3h) are most common in the Red River basin among Kadohadacho communities. The adoption and use of sandy paste Goose Creek Plain pottery by Woodland period hunter-gatherer foragers in eastern and southeastern Texas was apparently a better way to cook foods than the hot rock cooking/stone boiling in hide-lined pits or basketry of earlier times because stews/broths could instead be cooked and simmered in ceramic vessels. Traditional and new food stuffs could be prepared in ways that were more effective, leaving the food in the pot rather than to be subject to loss over open flames. The introduction of this new cooking technology after ca. 2500 years ago in Southeast and East Texas was not apparently associated with the use of any agricultural domesticate or the simmering of starchy foods. Only after ca. A.D. 800, in East Texas, were domesticated plant foods beginning to be prepared with a cooking technology where foods were cooked in ceramic vessels that were set directly over or in fire. Aten, L. E. 1983 Indians of the Upper Texas Coast. Academic Press, New York. Story, D. A. 1990 Cultural History of the Native Americans. In The Archeology and Bioarcheology of the Gulf Coastal Plain, by D. A. Story, J. A. Guy, B. A. Burnett, M. D. Freeman, J. C. Rose, D. G. Steele, B. W. Olive, and K. J. Reinhard, pp. 163-366. 2 Vols. Research Series No. 38. Arkansas Archeological Survey Research Series, Fayetteville. Hi Juan, There are lots of amazing archeological sites all over Arizona! We encourage you to get in touch with your local archeological societies and share your knowledge with the community.